T.D travels through time by drinking lots of alcohol, blacking out and waking up in a new era. While at first this was sort of interesting it has worn a bit thin after 2000 years. Unfortunately he’s an alcoholic and that sort of make things a bit difficult. Due to some other rather unique circumstances he’s about to start a whole new leg of his adventure that promises to just be a huge hassle that he’d rather not deal with. Join T.D as he is forced to team up with the most notorious serial killer in American history, an ancient pharaoh, and some other less famous people in an epic journey through time and space. Watch as they battle giant jive talking ducks, a racist beast, an evil reawakened demon billionaire, some other stuff and various assorted jackasses. Be engrossed as our hero attempts to avoid his duties, repress his emotions and dodge taking responsibility for any of his actions. This is the tale of the Time Drunk. 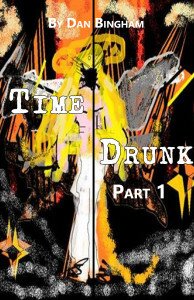 Time Drunk is only available as an ebook. It will be released as four parts. Part I is to be released on February 28.